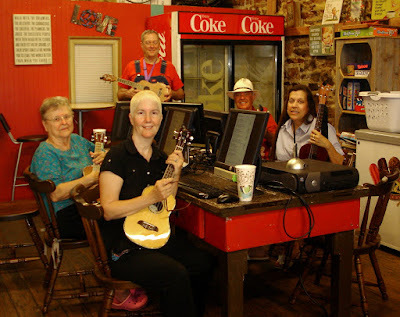 Tonight was our bi-monthly Highland Lakes Ukulele Club meeting and we had bunches of fun. Our experienced musician/new member Lee was able to make it this time. Don fixed Elizabeth's baritone uke that she played as a teenager, so that makes her an 'experienced beginner'. She jumped right in with enthusiasm and joy and she's got the fever like the rest of us! 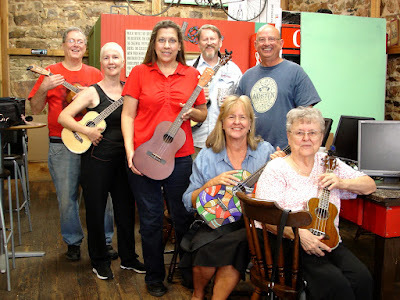 We enjoyed meeting our new members Daniel and Elizabeth, both beginners and thinking this is just about as much crazy fun as they had imagined (or perhaps they were just humoring me). We played our old faves from the current songbook and I've vowed to get some new songs in for the next meeting.